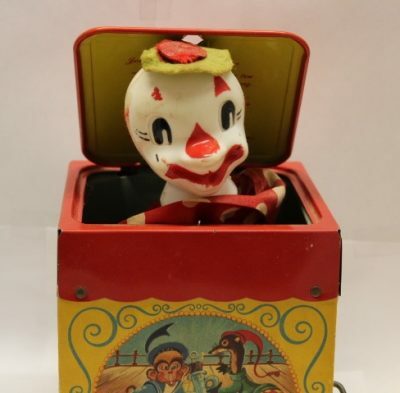 In celebration of the new “IT” movie we would like to share with you one of the creepiest toys ever made, the ‘Jack-in-the-box’. This 1950’s Vintage Mattel Creations Jack in the Music Box plays the tune ‘Pop Goes the Weasel’ when the crank is turned. Once the music stops the lid opens and out pops “Jolly-Tune” the Clown. The first documentation of a Jack-in-the-Box toy was in Germany in the early 16th century by a clockmaker as a gift for the son of a local prince. It was a wooden box that when cranked, would play music until a “jack”, or devil on a spring was suddenly released. In French, a jack-in-the-box is called a “diable en boîte” (literally “boxed devil”). Please check out our collectables for this and other clown items.